All types of MICRO-MESH™ are manufactured utilizing Ultra-Flex technology. Each type is long lasting, cushioned, extremely flexible, and re-useable. The Ultra-flex properties of MICRO-MESH™ allows it to conform to shapes conventional products cannot, giving you additional finishing options. Sheets with pressure sensitive adhesive backing can be ordered so that you can cut the MICRO-MESH™ to specific shapes, allowing you to adhere it to most any polishing device. All formats are made with large, very uniform crystals that recede into the Ultra-Flex matrix as pressure is applied, allowing the crystal tips to all line up so they are level with the part being polished. This technology provides a more brilliant, consistent finish. Ultra-Flex technology reduces crystal fracturing making it a long-lasting, high quality abrasive like no other on today's market. It also reduces heat generation that can wear out the abrasive crystals and cause orange peel, pitting or other surface imperfections in the part being polished. All formats of MICRO- MESH™ are available in sheets, rolls, discs, belts, Soft Touch Pads, specialty kits, and files. Please contact our Sales Department for custom made products. Micro-Mesh™ is what we like to call a non-abrasive abrasive. It is considered a cushioned abrasive in fact. Conventional sandpaper is designed to be aggressive so that it will dig deeply. In its manufacture the crystals are electrically charged so that they will stand up. They are locked into a hard resin and when you apply the paper to a surface it will literally tear in and remove the substrate of the material you are sanding. The crystals cut in a negative raking motion, leaving inconsistent scratch patterns. Micro-Mesh™ does the opposite. The backing is long lasting cloth to which an ultra-flexible cushioning layer is applied. 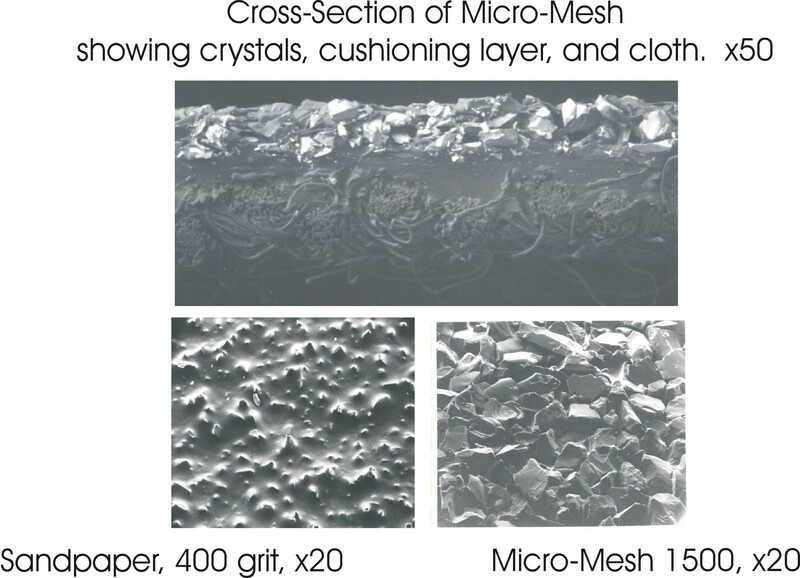 This cushioning layer will determine how far forward you can push crystals before they will penetrate the cushioning layer. On top of this layer, we have a very resilient glue, not a hard resin, but a completely flexible glue that will hold the crystals while allowing it to move and rotate. The crystals can turn in any direction without coming loose. When you start to apply pressure to sand with Micro-Mesh™, the crystals will go into the cushioning layer while beginning to cut a bit. If you push harder, they will go further into the cushioning layer, which serves as a safety valve. It determines how much pressure you can exert in a doward direction. Instead of a deep scratch that sandpaper makes, Micro-Mesh™ produce a refined scratch that is close to a RMS of 1.0. The cushioning layer also allows the crystals to cut with a planing motion that leaves an extremely consistent scratch pattern and allows you to achieve extraordinary levels of gloss. Where conventional abrasives will take surfaces down 2 or 3 thousandths (.002 or .003), Micro-Mesh™ will take it down one ten thousandth (.0001) or less. Use these products for finishing aluminum and for finishing solid surface countertops, such as Corian and Avonite, etc. Colour of these products range from off-white to yellow. This material is made to be used wet or dry, is made with a flexible cotton backing with polymer emulsion cushioning layer and large micron graded aluminum oxide crystals suspended in an ultra flexible resin bond. This material is available in the following 12 grades, from coarse, to fine: 300AO, 600 AO, 800 AO, 1500 AO, 1800 AO, 2400 AO, 3200 AO, 3600 AO, 4000 AO, 6000 AO, 8000 AO, and 12000 AO. A 300 AO scratch pattern is equivalent to the scratch pattern of 150 grit sandpaper, but is much more consistent. The 7 grades used for solid surface finishing are: 300 AO, 600 AO, 800 AO, 1500 AO, 2400 AO, 4000 AO and 12000 AO, depending on the type of finish you require. Please read our technical bulletin on solid surface finishing for more detailed information. For aluminum polishing please read over our technical information for Leading Edge Polishing. If you have only a small piece to polish, you may wish to use sheets as opposed as the Leading Edge Kit. The Leading Edge Kit is for removing light damage only. If you have machine marks that need to be removed, you may need the 300 AO, 600 AO, or 800 AO prior to using the 1500 AO, 2400 AO, and 3600 AO. Use these products for finishing plastics, acrylics, polycarbonates, bakelite, fiberglass, gelcoat, urethanes, celluloid,laquers, fiberglass, cast polymers, soft woods, soft metals, cultured marble, coatings, composites, and more. Abrasive colours of this product range from dark grey to light grey. This material is made to be used wet or dry, is made with a flexible cotton backing with polymer emulsion cushioning layer and large micron graded silicon carbide crystals suspended in an ultra flexible resin bond. *Grades 8000 and 12000 are made with aluminum oxide crystals. This material is available in the following 9 grades, from coarse, to fine:1500, 1800, 2400, 3200, 3600, 4000, 6000, 8000*, and 12000* REGULAR. 1500 MICRO-MESH™ is equivalent to a scratch pattern left using 400 wet/dry, but is much more consistent. Use these products for finishing metals, hard wood, cutlery, medical instruments, engine components, tools, dies and more. This material is made to be used wet or dry, is made with a flexible cotton backing with polymer emulsion cushioning layer and large micron graded silicon carbide crystals suspended in an flexible resin bond. *the bond in the MX is less flexible than in the REGULAR so you can achieve a high gloss on metals. Abrasive colours of this product range from dark grey to light grey. *Grades 800 MX and 1200 MX are made with aluminum oxide crystals. This material is available in the following 13 grades, from coarse, to fine: 60 MX, 80 MX,100 MX,120 MX, 150 MX, 180 MX, 240 MX, 320 MX, 360 MX, 400 MX, 600 MX, 800 MX*, and 1200* MX.60 MX is equivalent to 240 CAMI. The MX Series of abrasives can be purchased from our online shop. Use these products for finishing hard metal alloys, ceramics, natural granite, and natural marble. Abrasive colours of this product range from greenish gold to gold. This material is made to be used wet or dry, is made with a flexible cotton backing with polymer emulsion cushioning layer and large micron graded DIAMOND crystals suspended in an ultra flexible resin bond. This material is available in the following 14 grades, from coarse, to fine: 40 MXD, 60 MXD, 80 MXD, 100 MXD, 120 MXD, 180 MXD, 280 MXD, 400 MXD, 500 MXD, 600 MXD, 800 MXD, 1200 MXD, 1500 MXD,and 1800 MXD. 120 MXD leaves a scratch pattern equivalent to 180 grit sandpaper or 80 micron abrasives, but is much more consistent. Ultra-Flex MXD provides lower RA finishes while removing less stock,generating less heat, and outlasting competitive abrasives. Due to the fluctuation in the cost of diamond crystals, prices may change frequently.